New Channel 4/Warp Films drama demands your attention purely by the strength of its constituent members - written by 'Red Riding' scribe Tony Grisoni, directed by Sean Durkin of 'Martha Marcy May Marlene' acclaim, and starring top British acting talent including Eddie Marsan and Rory Kinnear. Then comes the intense subject matter - the events leading up to and following the killing spree of a lone gunman in a sleepy English town. Some SPOILERS follow. The sombre pre-titles sequence brings home the murderous aspect of this four-part drama from the outset, as a woman is shot from afar while tending to her garden. It isn't immediately apparent what has happened and such is the trend for 'The Hollow Shore', where shots linger and an absence of background music forces the viewer to think harder and delve deeper into the underlying emotion and drama of each scene. 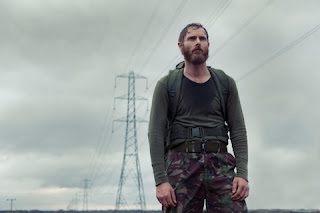 Sean Harris portrays the central character of Stephen Morton, a relatively unassuming figure - dishevelled and mocked by other Southcliffe residents for his obsession with the military but with a caring strand, looking after his elderly mother at home. Morton's military background becomes increasingly unclear as the episode progresses but pivotally, he earlier befriends young returning soldier Chris (Joe Dempsie). Chris struggles with what is likely post-traumatic stress disorder before the added emotional pain of the passing of a fellow soldier in a local hospital. Grief is set to be an important theme for the future episodes of 'Southcliffe' but for the time being, Chris' problems remain somewhat put to one side. Indeed, there are clear hints of potential future conflict with his wife. The relationship between Chris and Stephen takes a sour turn during a "training exercise", which has severe ramifications later in the episode as Chris and his SAS uncle seek retribution. This incident highlights a disturbing culture of abuse that many suspect exists in the armed forces - seemingly the catalyst for Morton's shooting spree but his life is consumed by difficult circumstances. While the psyche of a murderer is often particularly intriguing, the pre-series chatter regarding 'Southcliffe' has indicated that this will be secondary - instead, it will be the aftermath of the killings that will be warranted the most attention. With no Eddie Marsan throughout the whole of 'The Hollow Shore', the briefest cameo from Kaya Scodelario, and just a short introduction to Rory Kinnear's arrogant reporter, there is much still to come. What is most noticeable about 'Southcliffe' is its atmosphere - Sean Durkin has already done a terrific job in establishing the life-draining void of the town, unsurprising considering the tension he created in 'Martha Marcy May Marlene'. Stark and subtle, 'Southcliffe' has been driven by its unsettling acting performances - but perhaps more charitably viewed with the heavy expectation of deeper insights to come, which may prove to be challenging considering the range of cast members. 'Southcliffe' continues on Channel 4 tonight at 9pm. Catch up on 4oD.